Man alive if that doesn’t fire you up I don’t know what will! From the depths to the heights – it all belongs to God. We got to see our fill of mountains on our trip – especially the day we snowmobiled up and down them all day! I have to say, my God has quite an abundant stock of mountain peaks! And not only do the mountains belong to Him, but He owns all the cattle on those mountains as well (Ps 50:10). Praise you Lord, for You alone are mighty! 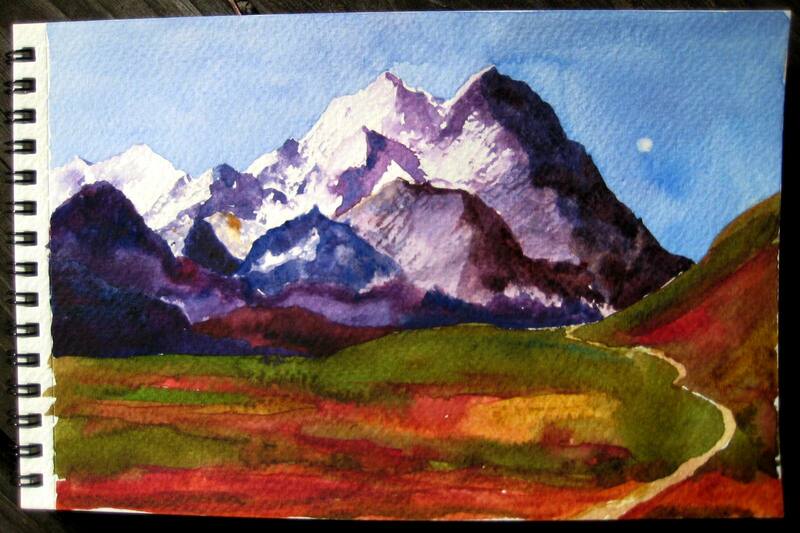 Here is a quick sketch of the mountains – it’s one of my favorites from the whole trip. sandi this is great! it reminds me so much of a little winding road in tibet. man, how i miss the mountains! Hey D! Grady and I were just talking about you a few minutes ago – we were saying how we want to get together with you and hear more about the ministry you’re working with. We’re going out of town in a week and a half, but we’ll give you a call when we get back and plan dinner together. Sandi: This is beautiful, of course. I love the intensity of the colors and the moon. Keep up the good work. M.
hey that is an great painting. Thank you Jessica!!!! Love you!